Bill Cruz channels his inner cowboy with clothes from Save a Horse Thrift Shop, 769 Cortaro Drive, which has been collecting clothes for the upcoming Denim and Lace fundraiser so attendees can purchase western attire at an affordable price. Fancy a little line dancing, good food and fun as you get your country on and raise money to help South County’s most vulnerable citizens? Then get your tickets, or sponsor, the Denim and Lace gala set for 5:30 to 9:30 p.m., Saturday, Nov. 3, at South Shore United Church of Christ, 1501 La Jolla Ave., Sun City Center. Short on cowboy duds? 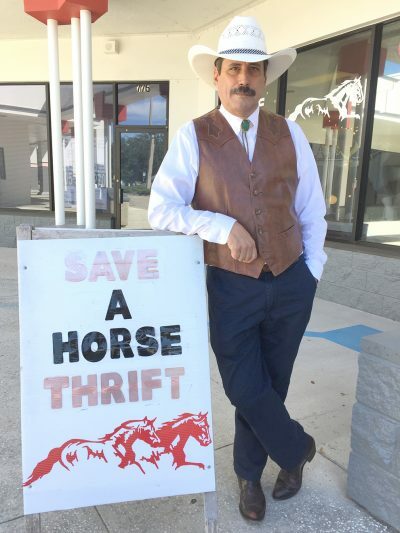 Save a Horse Thrift Shop, 769 Cortaro Drive, Sun City Center, is partnering with Good Samaritan (Good Sam) Mission, collecting clothes for the event at affordable prices. Call Save a Horse at 813-444-4064. The event is the annual fundraiser for Good Samaritan Mission, one of South County’s oldest charities, which emphasizes a hand up and not a hand out. The group asks clients, many of whom are poor migrant families, to take classes at the mission where they earn tokens to shop in the group’s food pantry. Good Sam’s client base has expanded to include the elderly, poor whites and African Americans. The 7th annual benefit will include “fellowship, entertainment, dinner and our very own Seeds of Change student Christmas Boutique,” said Jenna Norvell, Good Sam’s marketing coordinator. Funds raised from the dinner help keep the mission’s doors open throughout the year as it serves the neediest populations in South County. The mission recently moved to a new office, 767 Cortaro Drive in Sun City Center. It is open Monday through Thursday from 10 a.m. to 4 p.m. and Friday by appointment only. Tickets, which need to be purchased in advance, are two for $75; or four for $100. Sponsorships range from $250 to $1,000. Sixteen tickets at a VIP table, marketing material displayed on a 3-foot sponsorship table, table signage with your name or business logo. Inclusion in the GSM monthly e-newsletter for one year, quarterly direct mail, The Messenger for two quarters, recognition in all GSM print and social media promotions for the event, a full-page ad in the event program or multimedia presentation, recognition from the Praise Band during the event. Eight tickets at a VIP table, table signage with your name or business logo, recognition in social media promotions for the event, half-page ad in the event program or multi-media presentation, recognition from the Praise Band during the event. Eight tickets at a VIP table, table signage with your name or business logo. Call Jenna Norvell at 813-434-3959, or email jenna.gsmission@gmail.com to buy tickets, sign up, or for more information.